With over 35 years of experience in General Insurance Industry, IAA Haymarket began as a General Insurance Agent until 2004 when we joined Insurance Advisernet Australia network. Our experienced team pride themselves on their professional but friendly approach to providing our clients with a complete General Insurance Solutions to suit their individual needs, including Insurance Placement, Risk Management, Claims Handling and much more. Qualifications: Diploma of Insurance Broking, Senior Associate of ANZIIF and CIP. James specialises in the placement of a variety of risks including and not limited to Commercial & Industrial, Construction, Liability, Professional Indemnity, INT Liability, Builders Warranty, Marine, Prestige Residential, Management Liability, Cyber Insurance, etc. He is involved with the day to day business operations and has a hands on approach with all facets of the business. Qualification: Diploma of Insurance Broking. Patrica joined our branch in 2003 and started her career at entry level doing Certificate III in Business Services and recognised for her talent, she was promoted to an Authorised Representative. During her time here she has gained valuable experience and developed a good relationship with clients and insurers. Her goal is to provide a great friendly service to our clients. She specialises in Hair, Beauty and Nail Business Insurance, Large to small Business Packages, Construction Risk, Professional Indemnity, Builder Warranty, INT Liability, Domestic insurance and statutory classes (Workers Compensation and Compulsory Third Party (CTP)), Management Liability and Cyber Insurance. Qualification: Tier 2 in General Insurance through the National Insurance Brokers Association of Australia. Eddy joined our branch in 2004 after successfully running and selling his family grocery distribution business. With the guidance of our Managing Director James Choi, he has a good grasp of general insurance with the aid and training of Insurance Advisernet. Specialises in Small-Medium Business Insurances, Motor Vehicle Fleets, Property Owners/Operators, Construction, Builders Warranty, Retailers, Domestic, Management Liability and Cyber Insurance. Eddy assists our Asian clients (Cantonese). Qualification: Tier 2 in General Insurance through the Australian and New Zealand Institute of Insurance and Finance. Bachelor of Business. Sam joined our branch in 2009 as an Administrative Assistant and in 2013 he has been promoted to an Authorised representative. Specialises in Small-Medium Business Insurances, Motor Vehicle Fleets, Property Owners/Operators, Construction, Retailers, Management Liability and Cyber Insurance. Qualification: Tier 2 in General Insurance through the Australian and New Zealand Institute of Insurance and Finance. Bachelor of Commerce through University of New South Wales (UNSW). Cherie joined our branch in 2012 as an Administrative Assistant and in 2015 she was promoted to an Authorised Representative. Specialises in Business Insurance (Restaurants, Retailers and Offices), Commercial Property Owners, Strata Insurance, Builders Warranty, Domestic (Home Landlords), Motor Vehicle Insurance, Management Liability and Cyber Insurance. Cherie assists our Asian clients (Cantonese & Mandarin). Qualification: Tier 2 in General Insurance through the Australian and New Zealand Institute of Insurance and Finance. Bachelor of Business - University of Technology Sydney. Annie joined our branch in 2014 as an Administrative Assistant and in 2015 she was promoted to an Authorised Representative. Specialises in Business Insurance (Restaurants, Retailers and Offices), Commercial Property Owners, Contract Works, Builders Warranty, Residential (Home and Landlords), Motor Vehicle Insurance, Management Liability and Cyber Insurance. Annie assists our Asian clients (Cantonese). 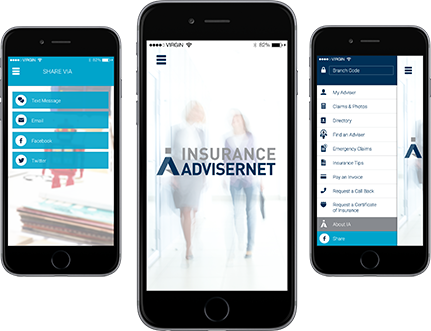 IAA Haymarket is a Corporate Authorised Representative of Insurance Advisernet (IA) founded in 1996. IA are a national organisation in both Australia and New Zealand and this allows IAA Haymarket the benefit of maintaining their local presence whilst being able to be part of a national group for products and services needed by their customers in todays complex business world. Thank you for contacting IAA Haymarket! Your message has been sent successfully. One of our skilled Advisers will be in touch with you shortly. For approximately nine years, in my capacity as Managing Director for Abril Building Solutions P/L, I have had dealings with James Choi and his team at Insurance Advisernet on a regular basis as they have been our broker throughout this time. During our dealing with Insurance Advisernet, my colleagues and I have found the entire team to be very reliable, always providing a prompt service. Regardless of the type of insurance we have needed or the claim we needed assistance with, we have found that they always conduct themselves in a manner which is helpful, timely and transparent. We appreciate that we can reply on them to respond to our queries on every occasion, ensuring the best outcome for us and have found the entire team to be very trustworthy. IAA Haymarket is a corporate authorised representative of insurance AdviserNet Australia Pty Limited. Corporate authorised representative number 320325.